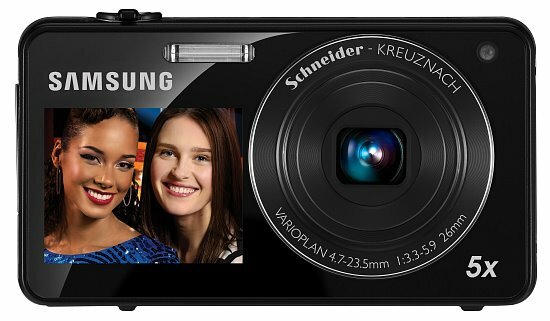 Samsung has created yet another fun and easy to use digicam. With competitive features for a 16-megapixel, ultra-compact camera, the ST700 also adds the versatility and fun of a front facing LCD. For $279 USD or less, the ST700 is sure to be a popular model. Read more in our Full Conclusion. 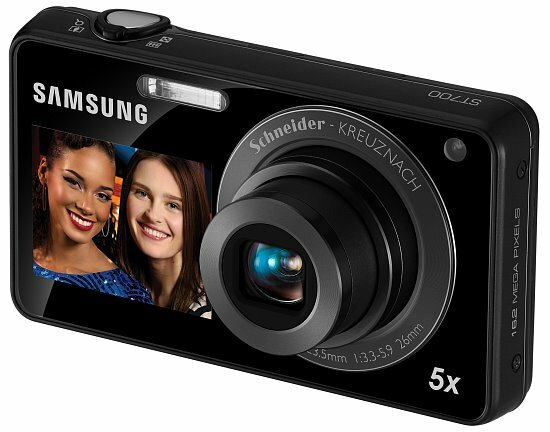 Samsung has updated the ST600 this year and will replace it with the new ST700, the flagship model in their series of compact Dual View point-and-shoot digital cameras. Dual View cameras are perfect for self-portrait aficionados (friends, families, bloggers) because there's an additional LCD screen on the front of the camera. The ST700 is very similar to the PL170 model in terms of features and performance, but costs around $80 more thanks to the largest front screen ever incorporated into a Dual View camera (1.8-inch) and the 3-inch touch screen for a main/rear display. Based on Samsung's proprietary smartphone technologies, the ST700 touch screen features Smart Access UI (user interface) for simple, intuitive operation. Other than the click and drag "app style" operation of Smart Access, the ST700 is pretty much a PL170. They both feature 16.1-megapixels of resolution, built-in Dual IS technology (Optical and Digital Image Stabilization), 5x optical zoom lenses (35mm film equivalent of 26-130mm), Easy Self Shot (a feature that only activates the front screen in order to assure added privacy), and an HDMI output for easy connection to your HDTV of choice. Samsung's ST700 also records 720p HD video at 30 frames per second in addition to taking large, sharp still images. For those who like to stylized imagery, Samsung offers both Smart 2.0 video filters (soft-focus, cinema, fish-eye, miniature, etc.) and Smart Auto modes (16 for still images and 4 for video) to help customize the look of your photos and video recordings. Smart Auto modes analyze key elements of your shots (such as brightness, color, and motion, and adjusts the camera's settings accordingly. The ST700 is available online and in stores now, with a MSRP of $279.99 USD. For the most current online pricing, see our buy boxes down below.